CompleteRemodel in 2013 and new bathroom and floors remodel in 2019. Our rental is spacious Studio condo. One of the nicest and best locations at the Kihei Bay Surf. Partial 'peek-aboo' ocean view, quiet first floor location away from the street, and fully equipped!!! King Size Bed, new bamboo style floors, granite counter tops, Queen pullout sofa sleeper, fully equipped kitchen, linens and towels provided, new appliances, flat screen tv, blu-ray/dvd player(with access to Netflix and other online services), free wifi wireless internet, beach gear (boogie board, snorkel sets, beach chairs),Pool, Hot Tub, Tennis Courts, and more. Only steps from the beach. We are now accepting reservations for the remainder of the year and into 2021 and beyond. Make your dream vacation affordable. Why pay for an expensive hotel, when you can have it all for a fraction of the price? Save money for other fun activities on the island. Thanks for checking out our little place in paradise. We look forward to helping you book your next trip to Maui. LAST MINUTE DISCOUNTS and RATES as low as $45 per night depending on length of stay and season. We have historically offered last minute deals for $35,$40, $45, $50, and $55 per night. We are booking as far out as you would like. Please feel free to contact us if you have any questions. Aaron and Marchelle (married) and Andy(best friend) purchased this unit in June of 2011. We gutted and totally remodeled the entire unit to create a modern and updated living space that we would feel comfortable staying in ourselves when we visit Maui. When we aren't hanging out in Maui you can find Aaron and Marchelle hiking and exploring the mountains of Colorado, or Andy working hard and partaking in the busy city life of New York City. Fresh and Newer interior, Comfy King Size Bed, quiet first floor location, peekaboo ocean view, fully loaded kitchen, free parking, highspeed wifi, beach gear, and more!!! Tiled Showertub with detachable showerhead. Guests will need to bring or buy their own shower soap and shampoo, as we do not keep it stocked and we find that many people have specific personal brands they prefer to use. We often times have some available under our sink vanity, but recommend guests bring their own as we cannot guarantee there will be any on hand. Quick 2 minute walk to Sugar Beach and Kaleapolo Beach Park. Fully loaded with cookware and everything you need to prepare meals while at the unit. 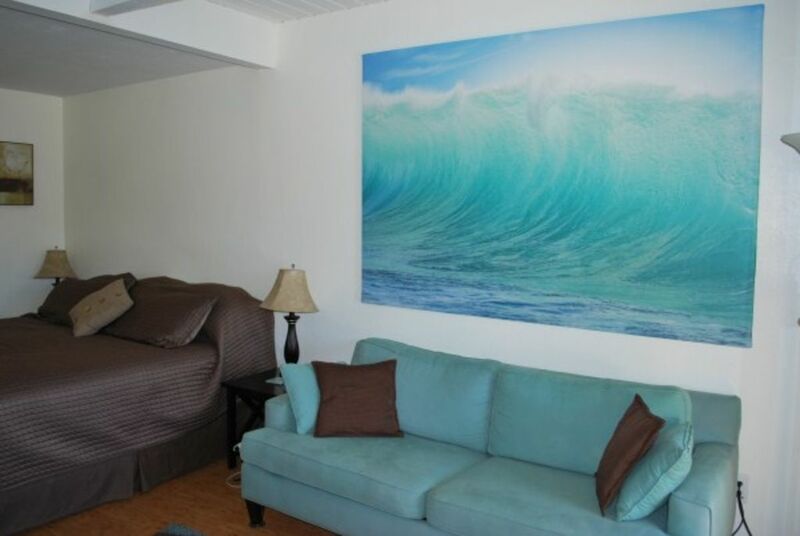 Beach Gear (beach chairs, snorkel sets, boogie board, fun noodles, cooler), New Furniture and Appliances, Linens Provided, Fully equipped Condo. Great studio. We especially loved the use of chairs, umbrella and cooler. The only con is location isn’t very walkable. Great location and price, comfy King bed. Cute place in a great location! The two of us enjoyed our stay in this unit. It is nicely decorated and had what we needed for some quick meals and having the beach equipment was a plus for us! The beach across the street is very nice and we saw several sea turtles there. The pool and hot tub area is clean and well kept as well as the bbq area. Overall a great stay. I would recommend this unit! Good location, had everything we needed, including a coin operated laundry on site. Have stayed at Kihei Bay Surf many times in last 10 years. Cannot beat the great location, quiet tenants, and awesome pool and bbq area. This room was very comfy with nice King size bed and nothing lacking in the kitchen. Great stay! Thanks for sharing your condo with us! Across the street from Whale Sanctuary and Kalepolepo Beach.